* Right Bank - This apartment is located on Avenue de Friedland at two minutes from Champs Elysees. The proverbial 'most beautiful avenue in the world' is at the Heart of a glamorous revival as Laduree, Louis Vuitton, Virgin, and Sephora have arrived, (Cartier very soon) as well as hip dinning destinations such as Man Ray, Kurova, Tanjia, Spoon, and Nobu. * At two minutes by foot you have the choice by subway line #1 to the Louvre, Beaubourg, Place des Vosges, and by line #2 to Montmartre or the Effeil Tower; The RER A will take you to the Opera and Galeries Lafayettes. There is a direct bus line to CDG airport as well as seven bus lines serving all of Paris. If you need to park your car, there is a public car park just downstairs. What could be better to visit Paris? * This romantic duplex/loft is located on the top floor (elevator+1 flight) of a beautifull 19 th century building, looking out on to a large and lovely courtyard. it's very quiet and protected from the street noise, safe, with a double digicode, and very central. The flat is 50 square meters (540 square feet), and as just been beautifully renovated. it is tastefully designed with modern furniture, real wood floor, a fireplace, and designer lamps creation by the owner/designer. * The three star restaurant Taillevent is around the corner and the wonderfull outdoor food marquet rue Poncelet is a ten minute walk away. * A free use of a computer with a speed web access in the flat. To receive more detailed pictures and a floor plan, please e-mail us at the address below. from home. It's location is superb! The owner was friendly, gracious and cooperative. I recommend this accomodation to anyone who wants a truly Parisian experience right in the heart of the city. Staying in your lovely flat in Paris made my trip to your city a remarkable adventure. It is the perfect alternative to a hotel and helped me feel like I was a true resident of my favorite international city. Your attention to detail, the lovely decor, the cleanliness, and the spacious rooms made my time there so comfortable. I would like to say that we had a wonderful time in Paris, and we really enjoyed our stay at your apartment. We can not say enough about the apartment. We really feel that for the price we got a great deal. Great location, great decor, and with views of the Eiffel Tower and the Arch deTriumphe from the roof. What more could you want? Thanks again for being so easy to work with. We look forward to staying with you next time we are in Paris. Just like to say how much my kids, my husband and I enjoyed staying at your loft. I hope we left it in good condition. Thank you. I must say I appreciated very much on how you made a special effort to provide your rentees with those instruction guides. We had a really great time and the apartment was perfect. Thanks soo much for your assistance and I look forward to returning to Paris and staying in your apartment again. I will defeintely refer you to my friends when they go to visit Paris. Your place is comfortable, extremely clean and well-equipped, and cozy. We loved the location, which was both easily accessible to the Champs-Elysees and the Metro, and very quiet at night to allow for sleep. Your chart of all the local shops was extremely useful. Thanks for your attention to all the logistical details, and your kindness during our stay. We will not hesitate to recommend your apartment to others visiting the City of Light! Sincerely. Just a quick note to say thanks for your hospitality while we enjoyed your flat. It was so great to have a real 'home' base so close to everything. The Paris Metro is really easy to use and we found all of the people very friendly. It is very comfortable and we will certainly contact you when we come to Paris again. Great for our family of 5. Excellent location and host was very helpful. Can see Arc de Triomphe from the front entrance and Champ Élysées just a street away. From the rooftop window you can see the Eiffel Tower too. Very quiet from inside the loft. Would definitely stay here again. We adored this flat - the location, amenities and comfort were perfect for us and our 14 year old son. Philippe provided everything we needed - thank you Philippe! I really enjoyed my stay in the apartment, everything was perfect and excellent. The property is perfect clean and secured with a very prime location which is only 2 minutes walk to the famous Avenue du Champe Elysees. All public transportation means is just 1 minute walk along the street including Bus and Metro stations. The flat owner (Mr. Philippe Gourdon) is very nice and friendly and is very helpful and informative with all required information that would maximize your convenience during the accommodation. I really enjoyed my stay at the flat with my family during our new year vacation and we hope to make it again. Many thanks to Mr. Philippe Gourdon for his hospitality. We couldn't have been happier with our stay in this Paris property. The layout and decor were incredbily quaint, and the owner, Philippe, was hands-down the most thorough and conscientious host I could imagine. His communication and instructions for making the most of our stay were top notch. The size of the place worked perfectly for our family (two adults and three young kids). As the listing suggest, the stairs to access both the apartment itself, as well as the lofted sleeping area, could be problematic for folks with mobility issues. But, for us, this only added to the charm. The apartment is well-equipped in the kitchen and bath - we really marveled at the clever use of every nook and cranny. Beyond being comfortable, the location truly couldn't have been better for us. Literaly steps from the Arc de Triomphe, we made ample use of the Metro stop that lies a few hundred meters from the front door. The neihborhood has plenty of shops and restaurants; plus, the Champs d' Elysee is basically right next door. This was the perfect place for our family to stay and I highly recommend it. 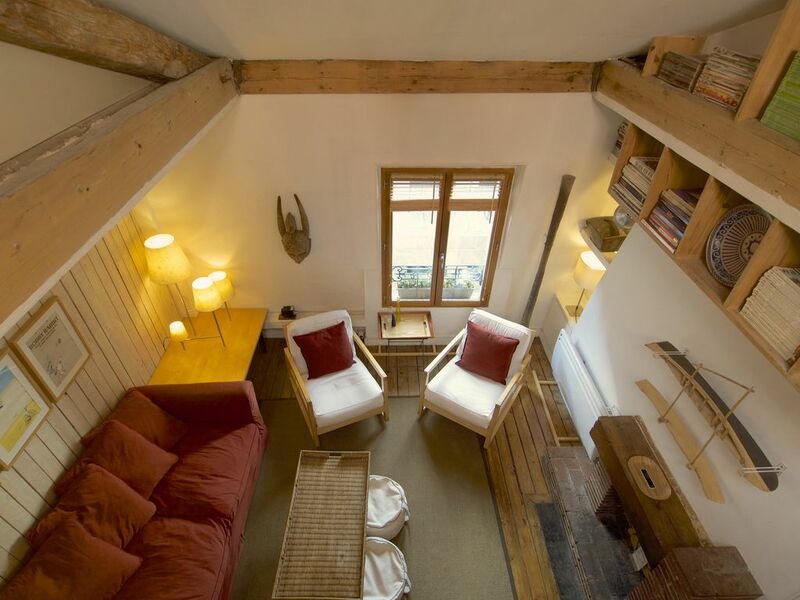 Excellent location, charming loft and great communication with Philippe! My husband and I were lucky enough to stay in Philippe's beautiful loft during our stay in Paris. My mother stayed with us as well and there was plenty of room for all of us. The washing machine was a major plus for a longer stay and Philippe has charge convertors such that we were able to use all of our electronics (which was not the case at other rentals). The location is superb - down the street from Arc de Triomphe, one street over from Champs-Elysees and right by the Charles de Gualle metro stop for easy access to all other interests. There is also a great family owneded restaurant down a little side street called Bistrot d' Arsene. Oh and you have a view of the Eiffel Tower from the window upstairs! Philippe is such a pleasure to work with as he truly thought of every detail. We had LOTS of questions prior to our arrival and he was so quick to get back to us. Merci beaucoup Philippe!